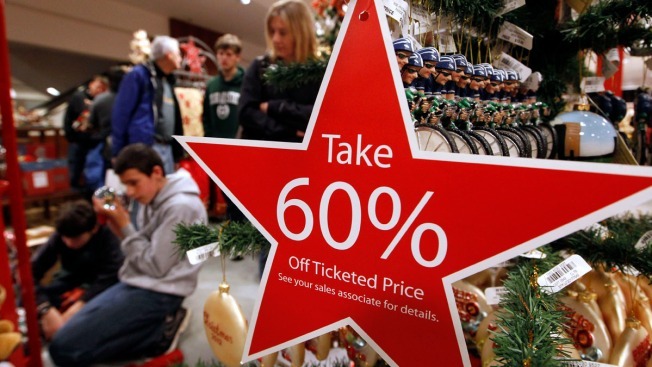 Shoppers look over sale items at a Macy's department store Friday, Nov. 23, 2012, in Seattle. Macy's will join other retailers this year to jump start Black Friday. The store will open just as families are finishing up Thanksgiving dinner. Macy's will be celebrating Black Friday this year starting at 8 p.m. on Thanksgiving. The retailer, which operates more than 800 locations, announced that it would be breaking the store's 155-year tradition of being closed on Thanksgiving for most of their stores. Macy's "began planning early" to allow associates "to volunteer for the shifts they prefer," the store said. The department store chain is now one of the growing number of stores to offer Black Friday deals a day early. In the past two years, retailers like Target and Toys"R"Us have begun opening on Thanksgiving and now Macy's is following suit. According to Holly Thomas, Vice President of Macy's Media Relations, employees are welcoming the chance for Thanksgiving hours. "Many associates want to work the 8 p.m. shift because they want to spend Friday with family or doing their own shopping," Thomas said. "Many of our people have never before had the opportunity to be off during the day on Friday." Thomas said approximately 50 percent of Macy's associates have volunteered to work an opening shift on Thanksgiving evening. "In aggregate, we have more than enough volunteers," she said. For Chicago shopper Rafael Negron, the early opening seems like a good way to boost the paychecks of workers. "That's the most important thing, I'm thinking, is people working," Negron said. According to a report by NBC Connecticut, not all employees are thrilled, however. "Let the shareholders work instead," wrote one worker, asking that her name and store location not be used. "This country has lost all regard for family values and tradition." While some shoppers like Negron say they are happy to be able to get a jump on shopping, many feel it is encroaching on the holiday. "That's horrible," said Manchester, Conn., resident Olga Talavera. "Thanksgiving should be sacred." New York City's Macy's Herald Square is one of the many stores that will open early nationwide. The store is famous for hosting the annual Thanksgiving Day Parade and will be opening on Turkey Day despite the festivities. "All elements are due to wrap as normally scheduled in the early afternoon following the conclusion of the Parade at noon," Thomas said. "The Herald Square store will open at 8 p.m. on Thanksgiving evening, along with most of the rest of our stores across the country." Most Macy's locations will be open for 24 hours, starting at 8 p.m. on Nov. 28 and ending at 8 p.m. on Nov. 29.